The art of motion pictures isn't limited to what's on the screen. Even the materials used to sell and promote a movie can be amazing works of art in their own right. This is particularly true of movie posters, which can become iconic not only for their aesthetic qualities but in how they represent a movie's story, mood, and themes. So, let's get the one-sheet out of the movie theater lobby and put it on display where it belongs... in our cinematic art gallery. For this inaugural entry, we'll examine the poster for Sam Raimi's dark superhero flick Darkman, as painted by John Alvin. Darkman tells the story of brilliant scientist Peyton Westlake, whose efforts to invent a form of artificial skin to help the disfigured are interrupted when a gang of criminals destroys his lab, leaving our hero gruesomely scarred and motivating him to wreak vengeance on his attackers. He uses his skin formula, which disintegrates over time when exposed to light, to create disguises that allow him to infiltrate the gang and set his enemies against each other. Despite not being based on a specific comic book character, Raimi roots the film in tropes and conventions of both the superhero genre, which would come in handy later for his Spider-man films, and the low-budget horror flicks he made a name for himself with. As such, Alvin creates an image that pays tribute to both sources. The dynamic pose of our hero, arm outstretched in an imperious and vaguely threatening manner, evokes the action stance you expect from the cover of a comic's first issue and yet it also suggests the sinister gestures of Chaney's Phantom of the Opera, whose shadowy machinations and legendary ugliness are also clear inspirations for Westlake's character. A large theme of the title character is his duality, as he attempts to balance his need for vengeance with his efforts to reconnect with his girlfriend, who thought him dead after the accident. This duality is nicely suggested by the use of color to bisect the image. On one side we have the cool blue of night, a period of darkness that Westlake's skin can safely exist in, allowing him to conceal his face. This darkness is cut by the search lights of the helicopters illuminating his hand, a nice suggestion of the efforts of the film's villains to uncover his secrets. On the other side, there are the orange flames that mutilated him and made him the creature he is beneath his disguises. These two halves are divided not in a straight vertical line but in a jagged diagonal, suggesting the askew headspace that Westlake exists in throughout the film. The various elements of the poster also hint at scenes throughout the story. As mentioned, the flames represent the character's fiery origin and the fact that Darkman's hand is on fire references his imperviousness to pain, a trait illustrated in the film when the character's bandaged extremity actually does catch alight when it passes too close to an open flame. The helicopters at the top left bring to mind the film's centerpiece action sequence, as Darkman dangles from his enemy's helicopter as it speeds through the L.A. skyline, visible in the lower left corner. Meanwhile, we see that character is pictured perched atop a girder of a building's skeletal frame, indicative of the film's climactic fight atop a skyscraper under construction. Alvin (whose work will no doubt be featured again in this series) painted several variations of this concept. 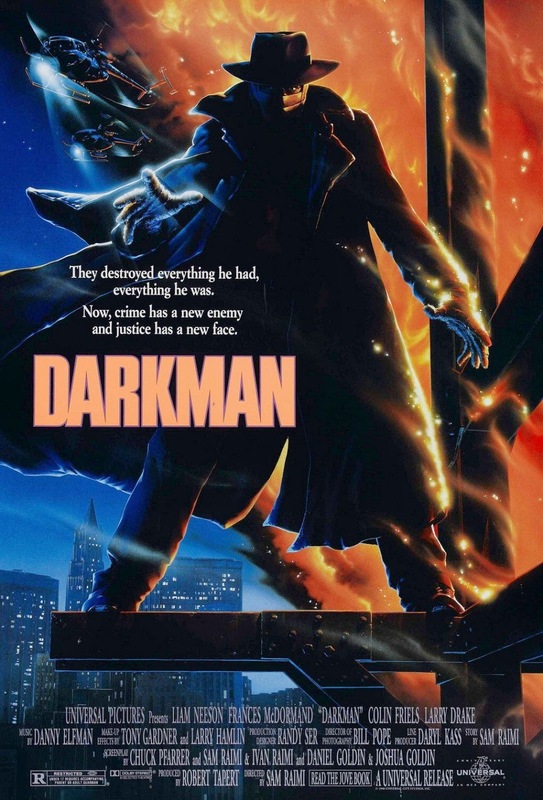 One can be seen on the novelization for Darkman, which has the character in the same pose minus the flames and backed by a giant full moon, while another offers a entirely different take from behind the character ominously peering at the city. While both are good, clearly Universal's marketing made the correct choice. Alvin's final poster perfectly captures the dark, flamboyant excess of Raimi's action fantasy.